Previously, I mentioned how to use Blame on GitHub.com to find the commit that changed a specific line. Today we’re going to rinse and repeat this scenario within Visual Studio. I told think anyone ever realized how scared I was of the world (if not plain neurotic) as a small child. I remember once in first grade (6 years old) being asked by the teacher for the answer to a multiple choice question. I thought it was ‘D’ but the answer was ‘C’. When the teacher said no that was wrong, I broke down sobbing from fear and embarrassment. I didn’t know what was going to happen to me for getting it wrong. I thought perhaps I’d get into serious trouble when I got home or lose my recess or something. Unfortunately, the teacher completely misread why I was crying (she thought I was acting out for attention) and scolded me, etc., which was my first foray into the self-fulfilling prophecy*. When was a specific line of code changed? as in, which commit changed a given line of code? What changed in that line? The Blame / Annotate window will appear on the left hand side. This window shows for each line what was the last commit that modified it. In the above example, lines 1-2 were last modified by commit ID 44af5057 (most likely my initial commit). But line 3, the one I’m interested in, was last modified in commit fd80ad89. 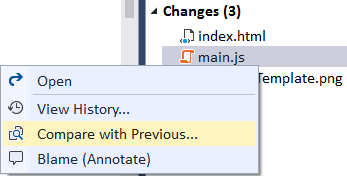 As any long time Visual Studio user will do… let’s click the fd80ad89 and see what happens! 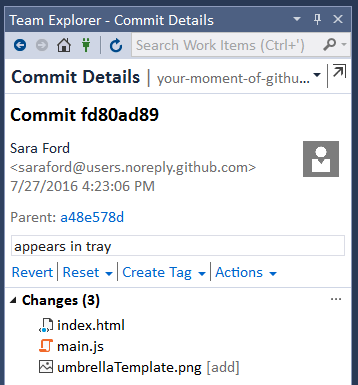 By clicking on the Compare with Previous… command in the context menu for the main.js file listed in the Changes list for that commit, you’ll see the file diff view appear. And now we have “the what” for what has changed in the file. The “Tray” const was added to the list, giving it a type of Electron.Tray, so I could put the app in the Taskbar tray (or Mac tray thingy at top of screen). *Sometimes I wonder if I’m the reincarnation of Rod Serling (technically, he died before I was born) or a zen master looking for a challenge. But then again, I’ve always hated smoking, so I’m not the former. And during the Visual Studio 2017 Launch Event when they were showing my Happy Birthday Visual Studio video, I was at home yelling at the Yoga DVD Instructor over the “share your breath with the community” breathing stuff, so it can’t be the later either.